I had such a great time on Tuesday night with the “Men and Women of Conviction” double feature that I had to go back the next evening for another pairing of Film Noir. 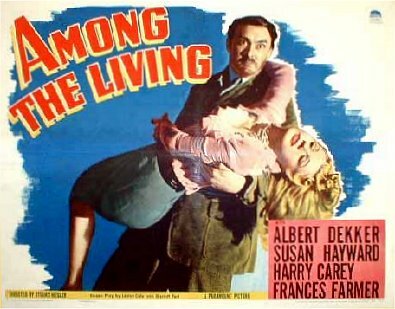 Wednesday’s selections were to be a double bill of Stuart Heisler films: Among the Living and The Glass Key. Unfortunately, there was a mix-up with the film company and the Music Box received the original 1935 version of The Glass Key instead. I was looking forward to seeing the 1942 remake, which is said to be the better of the two, but it was still a fun evening all the same. A rarely screened noir/horror hybrid about twin brothers — one insane, one not. After their father passes away, the mentally ill brother escapes from the mansion where he was secretly locked up and leaves to start a new life. Problem is that this man is not properly suited for reality and ends up becoming a serial killer on the loose. This early adaptation of Dashiell Hammett’s classic novel was noticeably different from the other three films I had seen at the festival. A heavier emphasis was placed on dialogue, and the movie was lacking in some of the more traditional noir elements. Still, it proved to be a capable replacement. 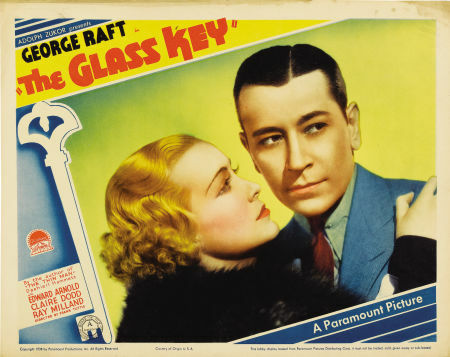 the glass key (1942) is this weeks viewing for the noir-a-thon, i didn’t even think about another adaptation. i’ve seen it before but i think it suffers the same as this one – dialogue heavy, not too many noir elements. i was quite surprised to find it was a Hammett novel because it felt totally different to other Hammett noirs.